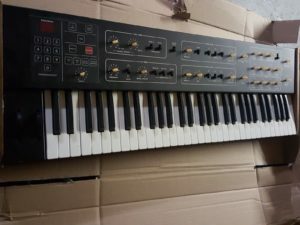 “The Prophet 600 was the first commercially available MIDI equipped synth (1981). I recently took out the key contacts and cleaned them (this is a commonly needed procedure for these). The keys are perfectly straight and the action is nice and even from key to key. This unit has not been modified in any way. These sound amazing. They can be extremely aggressive and biting. The cross mod capabilities are very nice. In very clean condition, please see pictures. and keys knobs, sliders, switches and jacks cleaning before shipping. Brand new switch panel installed. “These units are in excellent condition with minor scratches and general wear as pictured. Tested and working perfectly and having had a thorough test prior to listing. 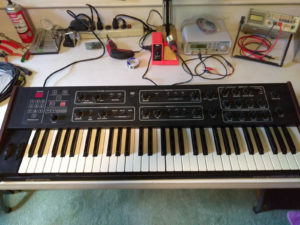 “Selling my p600 of which I am the original owner. I had it refurbished and the Gligli modification installed in 2015 by Wine Country. 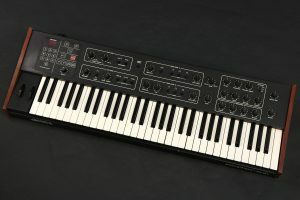 You already know that this is the original MIDI synth with a distinctively aggressive sound. 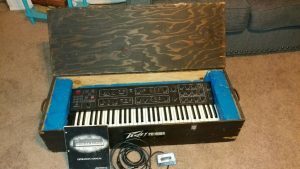 Includes original ePROM incase you want to de-Gigli-ize it. The unit is in excellent condition for it’s age. It has a couple of small dings on the wood ends which you can see in the photos. In good shape but partly refinished (top panel near wood ends), please see pictures. In very clean conditin, pictures say everything. 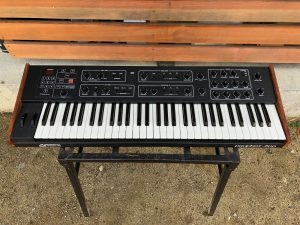 *This synth is 100% Functional. (Everything works as if it was brand new including all controls, pots, switches, LEDs, & input/output jacks.). *The electronics is 100% Functional. All VCO’s, VCFs, ADSR’s, VCA’s, LFO’s, etc work as they should. *The touch pad (membrane switches) works like new. *The keyboard action is like new and all keys are in alignment. All 61 keys are functional and none of them stick. 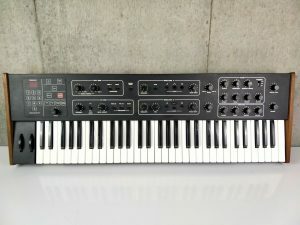 ” Prophet 600. In great condition everything works. Had it serviced 1 year ago. Doesn’t get played enough. One owner purchased in 1982. Has original box it shipped and stored in. 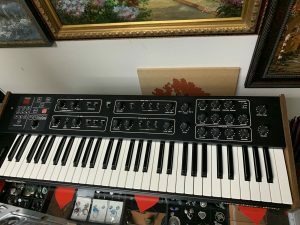 “This synth uses the same CEM 3340 VCOs you’ll find in the Prophet 5 Rev 3 and OBerheim OBXA/OB8. Pro Serviced (May 2018) with fulll calibration, GliGli installation, and keybed service. 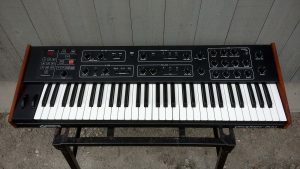 Gligli brings it up to specs with most modern synths regarding midi clock/sysex support/overhauled lfo and envelope sections/fm capabilities, filter drive and way more. 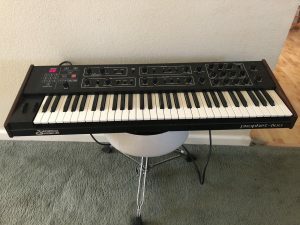 This is basically as close as you’ll get to a prophet 5 without spending 5-6 grand. 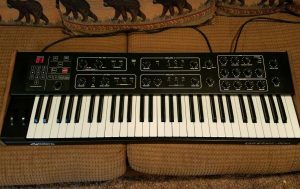 It’s a nasty nasty sounding synth especially for the money. Everything works, but you might want to clean the keybeds a touch. 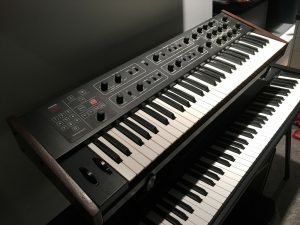 Pro serviced by Analog Synth Service May 2018. 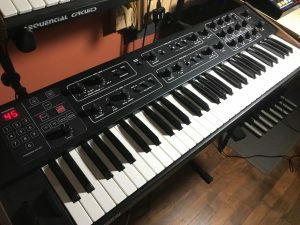 Sequential Circuits Prophet 600 with Teensy/GliGli Update installed. New membrane panel also recently installed. 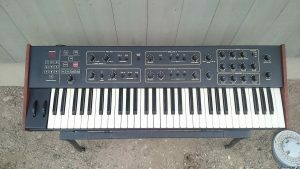 This synth is in excellent working condition with all keys, buttons, switches and knobs working perfectly. 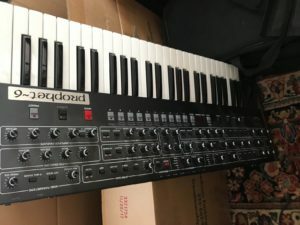 “Sequential Circuits Prophet 600 analog synthesizer. 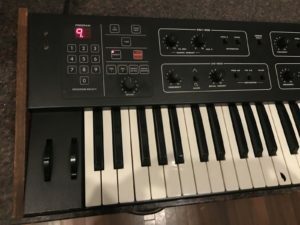 “Sequential Circuits Prophet 600 with GliGli Chip Update installed. The GliGli update basically it adds many new functionalities, such as making the envelopes punchier and adding more arpeggio settings, Google it! 1.) On a few programs, some keys are dead or weak, while in the rest of the programs all the keys sound out as they should. It exhibits this behavior since I pulled it out of storage. I probably should replace the battery but I don’t want to put any work/money into it unless I could verify it would fix the problems. “Great sounding piece I’ve rarely used over the years. Needs a new home. I got it in the mid 90’s exactly as is shown. Signed. 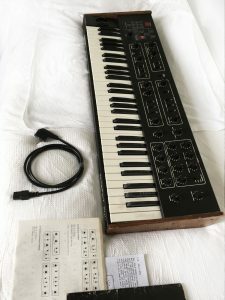 “Classic analog synth with amazing fat leads, lush brass, atmospheric pads and filter sweeps from early-mid 1980s, with MIDI, comes with hard case. The high A key was repaired professionally and is fully functional, just shows some slight discoloration. See pics for wear/scratches on wood and rest of body. Membrane keypad and LED display are new (exact replacement part), and were professionally installed. 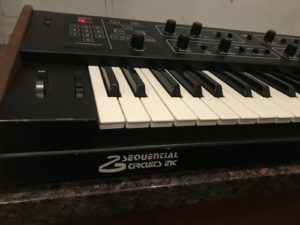 I played this keyboard for years in a gigging/recording band and loved the amazing analog sounds you could coax out of this thing. It has a unique and undeniable character. Has real heart as an instrument and I hate to see it go. “NOT WORKING! Will not turn on. 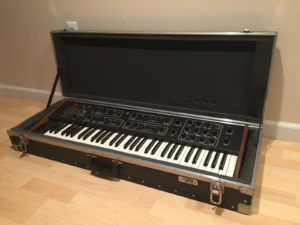 I have owned this synth since it was new for my home studio. See pics for superb cosmetic condition. Never gigged, never left it’s climate-controlled, smoke free environment. I do not know what the issue is, but before it went into storage I tested it and found several keys did not play. This was always played thru MIDI from my DX7, so I didn’t notice this before that. Hopefully someone familiar with these can bring it back to life-these instruments have a wonderfully rich sound and deserve to be played. It will ship with the original Owner’s Manual and a HYBRID flight case that I had made for it when new.